SKOP consists of collaborators Lara Kruger and Roché van den Berg, who share an interest in transforming rejected and seemingly useless objects into cleverly designed and desirable items. 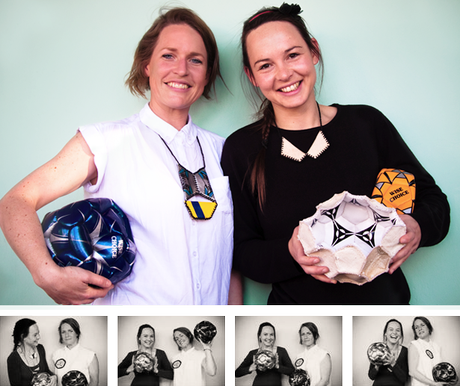 Their first joint project is a challenge to create design solutions for the up-cycling of 1000 reject soccer balls. SKOP involves the development of a dynamic range of functional and decorative interior objects, jewellery and surface designs. This is achieved by cleverly fusing traditional craft and high-tech manufacturing and branding methods. Adopting a playful approach they use eclectic and often contrasting techniques and colours to create objects that celebrate South African vibrancy and multiplicity. In addition to the focus on physical design the project aims to engage in social design practice by encouraging community involvement and exchanges, and creating opportunities for education, skills development and job creation.